This morning I want to introduce you to two new books from two of my favorite Christian romance writers. Kristin Billerbeck first sold me on chick lit with her delightful Ashley Stockingdale series. I simply loved those books. She's written other romances since then, and has a new one release this month. And Jenny B Jones is one of my newer discoveries. I adored her first women's romance (she also writes for the young adult market), and have to say this second one lives up to the promise of the first. Here's more. Save the Date is another great romance from award-winning author Jenny B. Jones. She has a gift for creating characters I want to root for and thrusting them into situations that make me laugh out loud while wondering how they can ever resolve their love life. Save the Date was no exception. This book is a must read. And I love what the author does with highlighting the outreach to young women who have outgrown foster care and need someone to believe in them while they transition. This book has so much heart! But the romance...sigh...it was perfect. I LOVED reading the ups and downs between Lucy and Alex. They both need each other...but the last thing either expects is love. The other thing the author does so well is incorporate a spiritual thread that adds to the story without detracting from it. This book really is a perfect blend of romance, laugh out loud moments, and heart. I give it two and a half very enthusiastic thumbs up. 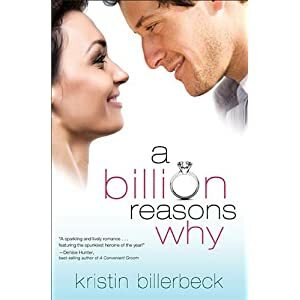 With a Billion Reasons Why, Kristin Billerbeck is back with a light romance that is a fun, quick read. Katie and Luc have a history that has kept them apart but also serves as a magnet attracting them to each other. Instead, Katie is ready to marry a man she met at her church. He's safe and predictable...but is that enough? This book didn't have the zany feel of her Ashley Stockingdale series, but reminded me of the Spa Girls series. It was a fun read, with interesting characters that kept me engaged. A great spring break read especially for those who love romance. Do We Shortchange Christian Youth?